Peru's President Pedro Pablo Kuczynski said on Thursday that it was time to evaluate pardoning the country's imprisoned former leader Alberto Fujimori, an apparent bid to placate the powerful opposition party led by Fujimori's daughter. The remarks came a day after Fujimori's supporters in Congress delivered their biggest blow yet to Kuczynski in his year in office by ousting his finance minister and targeting his interior minister for a potential censure. "I think it's time to look at it," Kuczynski told reporters about pardoning Fujimori, confirming comments attributed to him in an interview published on Thursday by the Economist magazine. Keiko Fujimori welcomed Kuczynski's remarks in the first hint of a truce with the opposition since last year. She has led her father's right-wing populist movement since he was jailed in 2009 for human rights violations. "It's time to act. Use your power as president. Pardon him," Keiko Fujimori said on Twitter. Kuczynski, who narrowly beat Keiko Fujimori in last year's presidential election, said at the start of his term that he would not pardon Fujimori but would be willing to sign legislation to let aging prisoners carry out their sentences under house arrest. However, Kuczynski's government has been dogged by clashes with Keiko Fujimori's party, which secured a solid majority of congressional seats in elections last year. 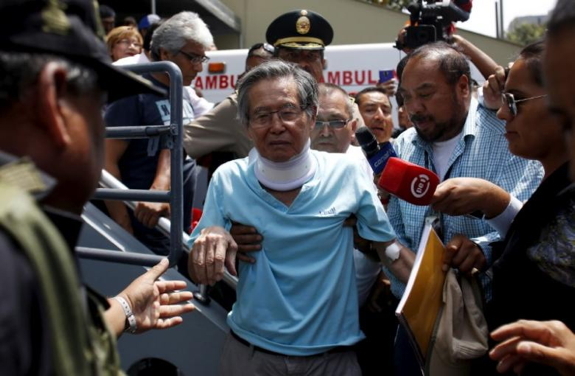 A presidential pardon would anger Fujimori's opponents, who rallied behind Kuczynski to help him scrape together a victory against Keiko Fujimori in a tight run-off. "(Kucynski's) being cornered and instead of fighting it out like a statesman, he's ceding to their pressure," Peru's biggest labor group, the CGTP, said.